There is a long history of coastal people using seaweeds, especially the large brown seaweeds, to fertilize nearby land. Wet seaweed is heavy so it was not usually carried very far inland, although on the west coast of Ireland enthusiasm was such that it was transported several kilometres from the shore. Generally drift seaweed or beach-washed seaweed is collected, although in Scotland farmers sometimes cut Ascophyllum exposed at low tide. In Cornwall (United Kingdom), the practice was to mix the seaweed with sand, let it rot and then dig it in. For over a few hundred kilometres of the coast line around Brittany (France), the beach-cast, brown seaweed is regularly collected by farmers and used on fields up to a kilometre inland. Similar practices can be reported for many countries around the world. For example in a more tropical climate like the Philippines, large quantities of Sargassum have been collected, used wet locally, but also sun dried and transported to other areas. In Puerto Madryn (Argentina), large quantities of green seaweeds are cast ashore every summer and interfere with recreational uses of beaches. Part of this algal mass has been composted and then used in trials for growing tomato plants in various types of soil. In all cases, the addition of the compost increased water holding capacity and plant growth, so composting simultaneously solved environmental pollution problems and produced a useful organic fertilizer. In a chapter about the agricultural uses of seaweeds, Blunden (1991) describes an interesting application of Ascophyllum as a soil conditioner in controlling losses of top soil. Like all brown seaweeds, Ascophyllum contains alginate, a carbohydrate composed of long chains. When calcium is added to alginate, it forms strong gels. By composting the dried, powdered Ascophyllum under controlled conditions for 11-12 days, the alginate chains are broken into smaller chains and these chains still form gels with calcium but they are weaker. The composted product is a dark brown, granular material containing 20-25 percent water and it can be easily stored and used in this form. Steep slopes are difficult to cultivate with conventional equipment and are likely to suffer soil loss by runoff. Spraying such slopes with composted Ascophyllum, clay, fertilizer, seed, mulch and water has given good results, even on bare rock. Plants quickly grow and topsoil forms after a few years. The spray is thixotropic, i.e. it is fluid when a force is applied to spread it but it sets to a weak gel when standing for a time and sticks to the sloping surface. It holds any soil in place and retains enough moisture to allow the seeds to germinate. Composted Ascophyllum has been used after the construction of roads in a number of countries, and has found other uses as well. For more detail see Blunden (1991: 66-68). Maerl is a fertilizer derived from red seaweeds that grow with a crust of calcium carbonate on the outside, the calcareous red algae, Phymatolithon calcareum and Lithothamnion corallioides. They grow at depths of 1-7 m and are found mainly on the coast of France near the mouths of rivers and calm bays, where the water temperature must be 13°C or higher. They are harvested by dredging or digging and are used to neutralize acid soils, as a substitute for agricultural lime. Maerl is more expensive than lime but is alleged to be better because of the trace elements it contains; however, there may be cheaper ways of adding trace elements. Seaweed extracts and suspensions have achieved a broader use and market than seaweed and seaweed meal. They are sold in concentrated form, are easy to transport, dilute and apply and act more rapidly. One of the earliest patents was applied for by Plant Productivity Ltd., a British company, in 1949. Today there are several products and brands available, such as Maxicrop (United Kingdom), Goëmill (France), Algifert (Norway), Kelpak 66 (South Africa) and Seasol (Australia). They are all made from brown seaweeds, although the species varies between countries. Some are made by alkaline extraction of the seaweed and anything that does not dissolve is removed by filtration (e.g. Maxicrop and Seasol). Others are suspensions of very fine particles of seaweed (Goëmill and Kelpak 66). For Goëmill, the seaweed (Ascophyllum) is rinsed, frozen at -25°C, crushed into very fine particles and homogenized; the result is a creamy product with particles of 6-10 micrometres; everything from the seaweed is in the product. Other chemicals may be added to improve the product for particular applications. Kelpak first appeared in 1983 and the originators say it is made from Ecklonia maxima by a cell-burst procedure that does not involve the use of heat, chemicals or dehydration. Fresh plants are harvested by cutting from the rocks at the stipe (stalk) and then they are progressively reduced in particle size using wet milling equipment. These small particles are finally passed under extremely high pressure into a low-pressure chamber so that they shear and disintegrate, giving a liquid concentrate. Seaweed extracts have given positive results in many applications. There are probably other applications where they have not made significant improvements, but these receive less, if any, publicity. However, there is no doubt that seaweed extracts are now widely accepted in the horticultural industry. When applied to fruit, vegetable and flower crops, some improvements have included higher yields, increased uptake of soil nutrients, increased resistance to some pests such as red spider mite and aphids, improved seed germination, and more resistance to frost. There have been many, many controlled studies to show the value of using seaweed extracts, with mixed results. For example, they may improve the yield of one cultivar of potato but not another grown under the same conditions. No one is really sure about why they are effective, despite many studies having being made. The trace element content is insufficient to account for the improved yields, etc. It has been shown that most of the extracts contain several types of plant growth regulators such as cytokinins, auxins and betaines, but even here there is no clear evidence that these alone are responsible for the improvements. Blunden (1991) summarizes the situation when he says "there is a sufficient body of information available to show that the use of seaweed extracts is beneficial in certain cases, even though the reasons for the benefits are not fully understood". Finally there is the question, are seaweed extracts an economically attractive alternative to NPK fertilizers? Perhaps not when used on their own, but when used with NPK fertilizers they improve the effectiveness of the fertilizers, so less can be used, with a lowering of costs. Then there are always those who prefer an "organic" or "natural" fertilizer, especially in horticulture, so seaweed extracts probably have a bright future. For useful discussions of most aspects of seaweeds as fertilizers, see Blunden (1991) and Chapman and Chapman (1980). The chapter by Metting et al. (1990) includes van Staden among the authors; he has made many studies on seaweed extracts so the chapter has a stronger emphasis on seaweed extracts, including a useful table summarizing studies that have been made on the effectiveness of seaweed extracts. For a review of the evidence for plant growth regulators in seaweed extracts, and their effectiveness, see Crouch and van Staden (1993). For a long time, animals such as sheep, cattle and horses that lived in coastal areas have eaten seaweed, especially in those European countries where large brown seaweeds were washed ashore. Today the availability of seaweed for animals has been increased with the production of seaweed meal: dried seaweed that has been milled to a fine powder. Norway was among the early producers of seaweed meal, using Ascophyllum nodosum, a seaweed that grows in the eulittoral zone so that it can be cut and collected when exposed at low tide. France has used Laminaria digitata, Iceland both Ascophyllum and Laminaria species, and the United Kingdom, Ascophyllum. Because Ascophyllum is so accessible, it is the main raw material for seaweed meal and most experimental work to measure the effectiveness of seaweed meal has been done on this seaweed. The seaweed used for meal must be freshly cut, as drift seaweed is low in minerals and usually becomes infected with mould. The wet seaweed is passed through hammer mills with progressively smaller screens to reduce it to fine particles. These are passed through a drum dryer starting at 700-800°C and exiting at no more than 70°C. It should have a moisture level of about 15 percent. It is milled and stored in sealed bags because it picks up moisture if exposed to air. It can be stored for about a year. Analysis shows that it contains useful amounts of minerals (potassium, phosphorus, magnesium, calcium, sodium, chlorine and sulphur), trace elements and vitamins. Trace elements are essential elements needed by humans and other mammals in smaller quantities than iron (approximately 50 mg/kg body weight), and include zinc, cobalt, chromium, molybdenum, nickel, tin, vanadium, fluorine and iodine. Because most of the carbohydrates and proteins are not digestible, the nutritional value of seaweed has traditionally been assumed to be in its contribution of minerals, trace elements and vitamins to the diet of animals. In Norway, it has been assessed as having only 30 percent of the feeding value of grains. Ascophyllum is a very dark seaweed due to a high content of phenolic compounds. It is likely that the protein is bound to the phenols, giving insoluble compounds that are not attacked by bacteria in the stomach or enzymes in the intestine. Alaria esculenta is another large brown seaweed, but much lighter in colour and in some experimental trials it has been found to be more effective than Ascophyllum meal. It is this lack of protein digestibility that is a distinct drawback to Ascophyllum meal providing a useful energy content. In preparing compound feedstuffs, farmers may be less concerned about the price per kilogram of an additive; the decisive factor is more likely to be the digestibility and nutritive value of the additive. In feeding trials with poultry, adding Ascophyllum meal had no benefit except to increase the iodine content of the eggs. With pigs, addition of 3 percent Ascophyllum meal had no effect on the meat yield. However, there have been some positive results reported with cattle and sheep. An experiment for 7 years with dairy cows (seven pairs of identical twins) showed an average increase in milk production of 6.8 percent that lead to 13 percent more income. A trial involving two groups each of 900 ewes showed that those fed seaweed meal over a two-year period maintained their weight much better during winter feeding and also gave greater wool production. The results of trials reported above and in the suggested reading below leave the impression that seaweed meal is probably only really beneficial to sheep and cattle. Certainly the size of the industry has diminished since the late 1960s and early 1970s, when Norway alone was producing about 15 000 tonnes of seaweed meal annually. Nevertheless, a Web search for "seaweed meal" shows that there are companies in at least Australia, Canada, Ireland, Norway, United Kingdom and United States of America advocating the use of seaweed meal as a feed additive for sheep, cattle, horses, poultry, goats, dogs, cats, emus and alpacas. The horse racing industry seems to be especially targeted. One interesting report from a United States of America university states that the immune system of some animals is boosted by feeding a particular Canadian seaweed meal. Obviously the industry is still active, pursuing niche markets and fostering research that might lead back to further expansion. Chapman and Chapman (1980) discuss several feeding trials and has tables showing the protein, fat, ash and fibre of some fresh seaweeds and seaweed meal, as well as the vitamin and mineral content of seaweed meal. Indergaard and Minsaas (1991), also have some composition tables, a more detailed description of feeding trials, a discussion on the place of iodine in animal nutrition and the importance of seaweed meal as a source of iodine. In fish farming, wet feed usually consists of meat waste and fish waste mixed with dry additives containing extra nutrients, all formed together in a doughy mass. When thrown into the fish ponds or cages it must hold together and not disintegrate or dissolve in the water. A binder is needed, sometimes a technical grade of alginate is used. It has also been used to bind formulated feeds for shrimp and abalone. However, cheaper still is the use of finely ground seaweed meal made from brown seaweeds; the alginate in the seaweed acts as the binder. The binder may be a significant proportion of the price of the feed so seaweed meal is a much better choice. However, since the trend is to move to dry feed rather than wet, this market is not expected to expand. There is also a market for fresh seaweed as a feed for abalone. In Australia, the brown seaweed Macrocystis pyrifera and the red seaweed Gracilaria edulis have been used. In South Africa, Porphyra is in demand for abalone feed and recommendations have been made for the management of the wild population of the seaweed. Pacific dulse (Palmaria mollis) has been found to be a valuable food for the red abalone, Haliotis rufescens, and development of land-based cultivation has been undertaken with a view to producing commercial quantities of the seaweed. The green seaweed, Ulva lactuca, has been fed to Haliotis tuberculata and H. discus. Feeding trials showed that abalone growth is greatly improved by a high protein content, and this is attained by culturing the seaweed with high levels of ammonia present. Much of the work on seaweeds and abalone has been published in the journals Aquaculture and Journal of Shellfish Research. In 1974, the American Gas Association decided to look for a renewable source of methane (natural gas) and sponsored a project to produce seaweed on farms in the ocean, harvest it and convert it to methane by a process of anaerobic fermentation. The project was divided into two parts: one the production and harvesting of the seaweed (biomass), the other the conversion of the biomass to energy (methane, that could be burned to produce energy). The seaweed chosen was the "giant kelp" that grows off the coast of California, Macrocystis pyrifera, because of its high growth rate and ease of harvesting by mechanical means. A test farm was built in the ocean, 8 km off the coast of southern California, and 100 kelp plants, 12-22 m long and taken from natural beds were placed on the farm test structure. Several storms and the resulting waves and currents caused abrasion of the kelp plants and many were lost. Further studies were made to find better ways of attaching the kelp and to make engineering improvements to the farm structure. However, it was eventually decided to move to smaller-scale, near-shore trials, but the offshore experiments did show that kelp would grow offshore and could utilize the nutrients in deep water upwelling by either natural or artificial means. The near-shore work concentrated on kelp yield and agronomic practices to improve growth rate and yield and avoided involvement in the engineering of offshore structures. Useful information was gathered in this work, and other types of seaweed were also investigated, such as species of Laminaria, Gracilaria and Sargassum. However, those conducting the other half of the project - biomass conversion to methane by anaerobic fermentation - found that Sargassum gave a poor gas yield. For Macrocystis, the gas yield was good and dependent on the mannitol and alginate content of the seaweed; more gas was produced if the mannitol concentration was high. For Gracilaria, the methane yield related closely to the carbohydrate content, and sometimes the protein content as well. More work is necessary to find better methods for the conversion step, biomass to methane, on a large scale, although the bench-scale work already done indicates that net energy can result from bioconversion, with good yields of methane. More engineering research is needed for the design of suitable open-ocean structures that will allow the kelp to survive storms and excessive wave movements and currents. Methane from marine biomass is a long-term project and research and development have been scaled down, probably to be revived when a crisis threatens in natural gas supplies. A useful summary of the work done from 1974 to about 1990 is given by Flowers and Bird (1990). A much more detailed report of the project is in Bird and Benson (1987). Some parts of a chapter by Morand et al. (1991) that has a particular emphasis on work in Europe, may also be of interest. "Extract of seaweed" is often found on the list of ingredients on cosmetic packages, particularly in face, hand and body creams or lotions. This usually refers to the use of alginate or carrageenan in the product, and their uses in cosmetics have already been discussed in earlier sections. More information on the use of these two hydrocolloids, as well as agar, can be found in the reference suggested below for further reading. The use of seaweeds themselves in cosmetics, rather than extracts of them, is rather limited. Milled seaweed, packed in sachets, is sold as an additive to bath water, sometimes with essential oils added. Bath salts with seaweed meal are also sold. Thalassotherapy has come into fashion in recent years, especially in France. Mineral-rich seawater is used in a range of therapies, including hydrotherapy, massage and a variety of marine mud and algae treatments. One of the treatments is to cover a person's body with a paste of fine particles of seaweed, sometimes wrap them in cling wrap, and warm the body with infrared lamps. It is said to be useful in various ways, including relief of rheumatic pain or the removal of cellulite. Paste mixtures are also used in massage creams, with promises to rapidly restore elasticity and suppleness to the skin. The seaweed pastes are made by freeze grinding or crushing. The seaweed is washed, cleaned and then frozen in slabs. The slabs are either pressed against a grinding wheel or crushed, sometimes with additional freezing with liquid nitrogen that makes the frozen material more brittle and easier to grind or crush. The result is a fine green paste of seaweed. There appears to be no shortage of products with ingredients and claims linked to seaweeds: creams, face masks, shampoos, body gels, bath salts, and even a do-it-yourself body wrap kit. The efficacy of these products must be judged by the user. One company recently pointed out that the lifetime of cosmetic products has reduced over the years and now rarely exceeds three or four years. Perhaps the seaweed products that are really effective will live longer than this. An interesting chapter on the uses of seaweeds in cosmetics, especially in Europe, has been written by De Roeck-Holtzhauer (1991). Other information, including some of that in De Roeck-Holtzhauer, can be found on a website constructed by the Department of Botany, University of Cape Town, but more easily accessed via: www.unam.na/henties/research.html (look for "seaweeds and cosmetics"). For those who have access to a database such as the Dow Jones Interactive Publications Library, a search for articles containing "seaweed" with "cosmetics", "harvest", or similar combinations, should reveal the types of products currently available and their claimed benefits. Cultivation of Gracilaria started in Taiwan Province of China in the 1960s as a source of raw material for its agar industry. At first cultivation was on ropes in ditches containing fish pond effluents, but by 1967 it was moved into the fish ponds themselves. This had the twofold benefit of the seaweed using the fish waste material as fertilizer and the fish eating the epiphytes, such as Enteromorpha species, that would otherwise become serious pests for the seaweeds. Control with tilapia (Oreochromis mossambicus) and milkfish (Chanos chanos) was satisfactory as long as the fish were removed before they started to eat the Gracilaria; larger fish were periodically removed and replaced by small fish. This concept of polyculture, or integrated aquaculture to use the more recent terminology, has since been utilized in many situations where the effluent from the aquaculture of one species, potentially threatening environmental damage, can be utilized by another species to its advantage, with a reduction in pollution. Various strategies have been tried. Seaweed cultivation around the outside of fish cages has led to significantly better growth of seaweed but was only partly successful in removing the large amount of nutrients coming from the fish cages (Figure 63). Unattached Gracilaria has been grown in the effluent from shrimp ponds (Figure 64). Semi-enclosed or land-based systems have been suggested, but the higher capital investment has been a deterrent. In Israel, an integrated system has been tried. Here the effluent from Japanese abalone culture tanks drained into a fish tank that used pellet feeding. The fish effluent in turn drained into a seaweed cultivation tank (species of Ulva); the seaweed produced was used to feed the abalone. The abalone and fish grew well, a surplus of seaweed was produced and the ammonia nitrogen in the seaweed effluent was reduced to 10 percent of the total amount fed to the system. In Hawaii, where Gracilaria species are eaten as fresh salad vegetables, shrimp farm effluent has been used to fertilize Gracilaria in floating cage culture. In Brazil, cage aquaculture of shrimp in the open sea has been studied in an attempt to reduce the environmental impact of the shrimp industry. 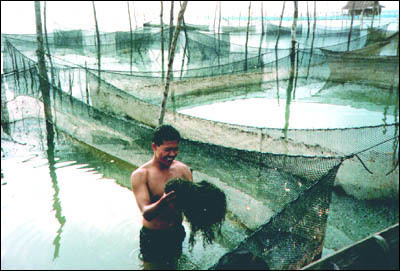 It was found that culturing seaweed inside the shrimp cages can improve the economic result for both shrimp and seaweed. In Chile, when Gracilaria seaweed cultivation was integrated with salmon farms the seaweed grew well and removed a large amount of the ammonium excreted by the fish. In France, trials were run with Gracilaria growing in closed and semi-enclosed systems, in the effluents from oyster farms; 90 percent efficiency was recorded in removal of ammonia coupled with useful growth of the seaweed. Porphyra species are the source of the human food, nori, and so their use in integrated aquaculture is an attractive economic alternative, particularly because they are very efficient in taking up nutrients. Trials are being run on the east coast of Canada and United States of America to combine Porphyra with salmon farming. These are just a few examples of the small- and large-scale uses that are evolving in the integrated aquaculture of seaweeds with other species. Integrated aquaculture is developing as solutions are sought to problems of environmental sustainability, including the management of coastal areas and the disposal of effluents from large-scale aquaculture activities. Gracilaria growing in fish cages (Songkhla Lagoon, Thailand). Unattached Gracilaria growing in effluent drains from shrimp ponds (southern Thailand). There are two main areas where seaweeds have the potential for use in wastewater treatment. The first is the treatment of sewage and some agricultural wastes to reduce the total nitrogen- and phosphorus-containing compounds before release of these treated waters into rivers or oceans. The second is for the removal of toxic metals from industrial wastewater. Eutrophication is the enrichment of waters with nutrients such as minerals and nitrogen- and phosphorus-containing materials. This frequently leads to unwanted and excessive growth of aquatic or marine plants; blooms of blue-green algae are an example, unfortunately becoming more common. Eutrophication can occur naturally, but it can be accelerated by allowing water, rich in dissolved fertilizers, to seep into nearby lakes and streams, or by the introduction of sewage effluent into rivers and coastal waters. Seaweeds can be used to reduce the nitrogen and phosphorus content of effluents from sewage treatments. Many seaweeds have a preference to take up ammonium as the form of nitrogen for their growth and ammonium is the prevalent form of nitrogen in most domestic and agricultural wastewater. Another important feature of many seaweeds is their ability to take up more phosphorus than they require for maximum growth. It would be preferable to use seaweeds that have some commercial value, but these do not necessarily have the ability to withstand the conditions encountered in the processing of the wastewater. There is a need for the seaweed to be able to tolerate a wide variation in salinity because of the dilution of salinity by the sewage or wastewater. Intertidal and estuarine species are the most tolerant, especially green seaweeds such as species of Enteromorpha and Monostroma. Of the red and brown seaweeds that are of interest because of their commercial value, tropical or subtropical forms have been successfully used, while cold-temperate species are usually too sensitive to changing seasons and may fail to grow (and remove nutrients) in the winter months. While many investigations have demonstrated the suitability of seaweeds for wastewater treatments, their use on a large scale is yet to be implemented, although this may change with the increasing realization of the need to protect marine environments. A good discussion of this topic can be found in Schramm (1991b), which includes a table showing the seaweeds that have been tested or used for wastewater treatment, together with references to the original publications. The accumulation of heavy metals (such as copper, nickel, lead, zinc and cadmium) by seaweeds became apparent when those seaweeds used as human foods were first analysed. The heavy metal content, especially of the large brown seaweeds, varied according to their geographic source and sometimes to their proximity to industrial waste outlets. From these studies came the idea of using seaweeds as biological indicators of heavy metal pollution, either from natural sources or from activities such as mining or disposal of industrial wastes. This has been successfully implemented using brown seaweeds such as Sargassum, Laminaria and Ecklonia, and the green seaweeds Ulva and Enteromorpha. A further extension of this ability of some seaweeds to take up heavy metals is to use them to remove heavy metals in cleaning up wastewater. While there have been many small-scale trials, it is difficult to find reports of actual implementation on a large scale. Milled, dried species of the brown seaweeds Ecklonia, Macrocystis and Laminaria were able to adsorb copper, zinc and cadmium ions from solution. In another laboratory-scale trial, Ecklonia maxima, Lessonia flavicans and Durvillaea potatorum adsorbed copper, nickel, lead, zinc and cadmium ions, though to varying extents depending on the seaweed type and metal ion concentration. After the extraction of alginate from brown seaweeds there is an insoluble waste product, mostly cellulose, and the adsorbing properties of this have been tested and found to equal some of the brown seaweeds. Using such a waste material is obviously more attractive than use of the dried seaweed itself. Another waste product, from the production of Kelpak, the liquid fertilizer previously mentioned, has also been tested and found to adsorb copper, cadmium and zinc just as effectively as the seaweed from which it is derived. So there is the potential to use either seaweed or residues remaining from seaweed extraction. It is a matter of whether this is the most economical way to do so, depending on their availability and cost at the source of the wastewater. A recent review by Pan, Lin and Ma (2000) is a useful starting point. For some examples of trials using seaweeds and seaweed residues, see Valdam and Leite (2000), Stirk and van Staden (2000), Aderhold, Williams and Edyvean (1996) and Figueira et al. (2000). In this last reference, look in the Introduction for earlier papers published by B. Volesky as these illustrate the type of investigations that have been made in this topic over the past decade.